Message from the front propaganda company. Map of Western Europe with boundaries marked on it in Germany, Belgium and Holland. With the transfer of German troops on May 10 offensive boundary line is moved to the west. May 15 - broken line Mazhino.16 May to surrender Holland. 26 May to the fall of Calais. 28 May - the capitulation of Belgium. Departure of the German "Shtukas" on the blockade of the Strait of Pas-de-Calais. City Dyunkirhen air, destroyed bridges visible. Dive to a new target. The next goal - Fort Louis. View from the front propaganda company. 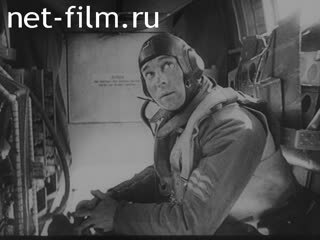 In the sky "Shtukas", taken off on a mission to destroy the British transport ships. The raid on the port Dyunkirhen. Planes fly low over the sea. German coastal battery is preparing to open fire on British ships. The ships also opened fire. Bay, view of the battery. At sea, the German torpedo boats. English plane crashes, pilot landed by parachute. Shot down the second plane, it falls into the sea. Hit by a third plane circling over the sea drops. English fighter, lying half on the shore. After the fight, the waterlogged ship. German soldiers have handed down to the shore of the enemy ships. The patrol passes along the shore. Broken English plane smashed the British and French technique. On the outskirts Dyunkirhena wrecked military vehicles, dilapidated houses, fires, bombed-out neighborhoods.